I wanted to love American Sniper. I finally saw it for the first time a few days ago, and I was excited. This is an R-rated movie that attracted bigger audiences in the U.S. than any other blockbuster in 2014. I had to see what it was all about and how it had become such a huge success. Unfortunately, I was pretty underwhelmed by American Sniper. I don’t think it’s bad, but it didn’t have anything particularly special to propel it above all the other films I enjoyed from last year. I know this is based on a true story, and not every love story is going to be extremely compelling, but man is this a boring romance. Chris Kyle goes to a bar and meets a girl who expresses zero interest in him, even while acting extremely flirty. She drinks too much, vomits on his shoes, and the next thing we know they’re sleeping together. How romantic. I’m sorry, but there’s nothing compelling about this relationship. She quickly transforms into a worried wife, telling him he needs to spend more time with her and his children. But I simply feel no connection to her or him, and I’m not terribly invested in seeing their marital problems unfold onscreen. One of the first times we see Kyle as an adult, he comes home to find his girlfriend cheating on him with another man. Kyle throws them both out of his house. They’re never mentioned again, and the whole affair just feels like such a waste of time. We don’t get much context for what should be a dramatic turn of events, nor do we ever see that this had any effect on Kyle. This movie needed to spend more time developing Kyle’s relationship with his wife and kids, so having this little detour only served to delay moving on to more important things. I love the scene where Kyle’s father tells him that there are three types of people: sheep, wolves, and sheepdogs. That’s a pivotal moment that informs Kyle’s actions throughout the film. Which is why it’s so frustrating that it just kind of sits there and is never revisited. Kyle is obviously a sheepdog, watching over his younger brother and his fellow soldiers and keeping them safe from ravenous wolves. But there’s no moment where his father’s words hit home or are really brought back into the story in a powerful way. Such a wasted opportunity to drive home a powerful metaphor. Kyle protects his little brother from a bully in school and then hangs out with him at rodeos when they grow up. They both enlist in the military, and Kyle sees his brother briefly at an airport in the Middle East as he’s coming in and his brother is going home. They share a tender moment, but from then on that brother no longer plays any part in the story. What happened to him? It seemed like the film was building up their relationship at the start, but there was never any emotional payoff. What made Chris Kyle a legend, greater than any other sniper in U.S. history? There are subtle hints, like when he shoots a snake on a firing range and tells his commanding officer that he is more accurate when he’s shooting at something living. And we certainly get a sense that he loves his country and cares about his friends on the battlefield. But we don’t see him using his deadly accuracy enough or delve deeply into his mind to understand what made him so unique and great. How can we tell that he’s better than other snipers when the only other sniper we see is Mustafa, and he seems to be on par with Kyle’s sharpshooting abilities? The portrayal of a soldier who can’t adjust to civilian life and feels more comfortable in dangerous situations in the Middle East was done quite well in The Hurt Locker a few years ago. 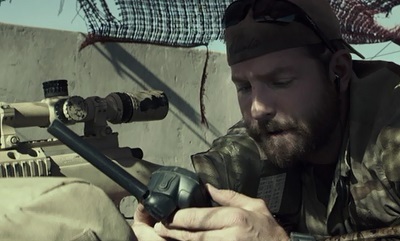 American Sniper fails to bring much to the table that that film didn’t already explore. Even Glory, back in 1989, demonstrated the effects of shellshock more effectively than this film. Also, American Sniper takes the awesome line of dialogue “Aim small, miss small” from The Patriot (2000) without acknowledging where it came from or adding a new element to it to justify the reference. You knew this was coming, and everyone has already commented on how awful the fake baby is. I’ll just say that it completely took me out of the scene and I couldn’t concentrate on what I know was meant to be a serious conversation between Kyle and his wife while he’s holding a limp, lifeless doll. I definitely wanted to see Kyle kill his nemesis, the evil sniper Mustafa, but the way that he wound up doing it seemed to go against everything he’s supposed to stand for. He’s all about protecting his men. He knows that reinforcements are several minutes away and that he and his men are surrounded by enemies. The tiniest sound will put them all in serious danger. Rather than call an airstrike or some other means of killing the bad guy, he decides he has to do it himself and he shoots that terrible guy. It’s satisfying to see him kill Mustafa for that one moment, but then everything comes crashing down. He risked getting himself and all of his men killed as a result of that action. That’s not exactly acting like a sheepdog. When we see Kyle call his wife while he’s deployed, it’s never in the evening when he has some personal time. It’s always when he’s supposed to be concentrating on a mission. This just comes across as needlessly reckless. I realize the film is trying to build tension by connecting the two characters during stressful moments, but does the military really allow on-the-job phone calls to loved ones? Multi-tasking can be deadly when it distracts you from a life-and-death situation! I’m sure Kyle was an amazing man, and I don’t mean to be rude. This movie just doesn’t do a good job of showing his transition at the end into a loving husband and father. He’s spent most of the film obsessed with his job in the military to the point of neglecting his wife and children. But suddenly after he kills Mustafa, he has no problem leaving all of that behind and devoting himself fully to his family. How did that happen? It’s just not handled well at all. American Sniper has surprisingly small ambitions. I didn’t feel like it added anything particularly new to the genre. It’s a decent war movie, chronicling the horrors of the Islamic terrorists’ tactics during the War in Iraq. But its moments of greatness are pretty sparse. It spends a lot of time showing Chris Kyle doing things without exploring what made him the legend that he is. Maybe I expected too much from this film. Again, I don’t think it’s bad. It’s just not for me. American Sniper aimed to pay a small tribute to a hero and wound up widely missing the mark. This entry was posted in Random Stuff and tagged action movies, books, clint eastwood, films, history, iraq war, middle east, movie review, movies, movies based on books, relationships, romance, true stories, war, war movies. Bookmark the permalink. I agree! I wanted to love this, too, and it was meh for me. 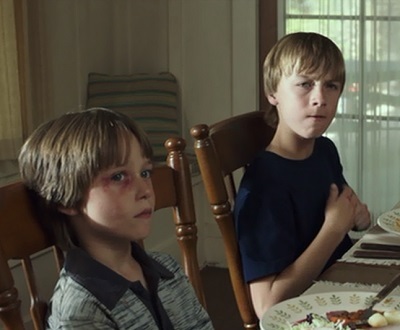 The most important line in the film for me was the dad explaining 3 types of people in the world. Ya know, I’ve been quoting that and designating myself a sheepdog for weeks now. It should have played out more. “Aim small, miss small” was huge as the fake baby. Seriously, I wouldn’t be surprised he could or would call his wife while on top of the roof. That’s just too crazy NOT to be true. Great post. Thank you. I try not to be too negative in my reviews of films because any film takes a lot of effort to put together. This one just got so much praise and attention that I’m astounded to find that the emperor has no clothes. It’s just another war movie. That’s too bad. Yes, I agree. I thought The Hurt Locker was better. Thank you for finally writing something about this. American Sniper was a good movie but it definitely didn’t deserve a best picture Oscar nomination, which should have gone to Nightcrawler / The Babadook. Thank you. Sometimes I just don’t understand why a film becomes so popular when it’s pretty mediocre. A lot of people are just better at looking past a film’s flaws, but I usually can’t do that. I’ve heard good things about Nightcrawler. Maybe I’ll have to check that out next. Agrees on all points. Disappointing film. Yeah, I really struggle to understand why this movie made so much money when it’s not on par with other excellent war movies that made a fraction of this one’s take. So weird.